On this formal day of burial in Rome, and these days of remembrance here at Dunwoodie, we read from and listen to the Gospel of St. John. A very rich text of St. John with a familiar exhortation, a persuasive promise and the great description of truth. Next, the great personal promise. Jesus explains to His followers then and now – that He must go to prepare a place for you and come back again and take you to Myself “so that where I am You may also be” (Jn. 14:3). The great personal and persuasive promise of the New Testament, the motive for everything we do and live “that where He is we may also be.” I offer that as my personal prayer today: that where Jesus is today John Paul may also be. And last, how do we know the way to where Jesus is – Jn. 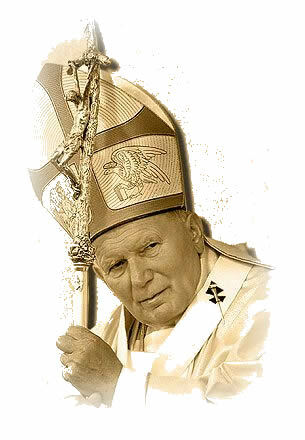 14:6, the Lord’s own self-description: “I am the Way and the Truth and the Life.” Jesus describes Himself as The truth – the truth of Jesus Christ – that was the centerpiece, the heart and lung machine of the teaching, preaching and living of John Paul II. The man was transparently in love with Jesus Christ. Jesus was his way and his truth and his life. An early 20th century author once wrote: Not all GREAT men are GOOD men, and not all GOOD men are GREAT men. Many, perhaps most great men and women are not saints, not even close – they may do things with great effects, but saints they are not. On the other hand, they are many GOOD people, truly good people whom we never hear of or read about or even know of whom don’t accomplish great things. But, this morning in Rome they buried a really GREAT man who was truly a GOOD man. President Bush, I think, got it exactly right when he described the Pope as a Humble, Wise and Fearless Priest. He was not afraid, he knew where he was going and he knew the way. The media coverage of the Pope’s death, mourning, funeral and burial had been massive – the Father of the largest family on earth has died and the family, apparently, the entire family has paused to offer their love and respect. Of all the things said about the Pope, no one, to my knowledge, has suggested that he was not truly or fully Catholic. Without saying so or perhaps intending so, the media, the secular media has reviewed for us at great length the marks of the Church – the One, Holy, Catholic, Apostolic (ccc 811-87). Those marks of the Church were the hallmarks, the fingerprints and footprints, the spiritual DNA of John Paul II: One, the Unity he preached and lived: professing one faith, one common worship, governed by one successor of St. Peter and the Bishops in communion with him. Holy, that Jesus Christ the Church’s founder is holy, has the sacramental means of holiness and that some of her members are holy – and we saw in the personal holiness of this man of steady prayer and absolute devotion who led the way and the call to holiness in beatifying and canonizing so many of the elect. Catholic, anyone who looked at any TV over the last 6 days saw lines of pilgrims from everywhere – from all over Italy and all over the world they came to Rome out of simple respect to pay respect to the universal shepherd of us all. One young couple from Croatia touched me, as I listened to them. A four-hour bus trip to the Adriatic, a ferry trip across the Sea, another bus trip across Italy to stand in line for 10 hours. The young woman said the Pope deeply affected her life, but her husband when asked about the wait and trip said simply – no problem, he had come to say goodbye and thank you. Goodbye and Thank you. Sometimes the greatest simplicity is the greatest eloquence. Apostolic, the late Pope visited 129 countries, truly the missionary Pope who traveled everywhere for the same purpose with the same message that Jesus is the Way and the Truth and the Life. Whether intended or not, these marks of the Church and of this Pope were paraded before us in living color 24/7. Factually, I don’t challenge their arithmetic, but such statements are more than a little bit of misleading. Very misleading. To say over and over, HIS teaching, HIS – as if they were the personal inventions of the past 26 years is a little absurd. Whether it’s life’s beginning, or its natural end, or its personal transmission in true marriage, all of these are Catholic teachings and have been for centuries before this Pope was even born. Some seem to forget that the Pope is first a believing Catholic himself. And like any other Catholic teacher he is first a witness to Catholic teaching; what’s found in Sacred Scripture and Sacred Tradition. Not only is the Pope the servus servorum Dei, the Servant of the Servants of God, he is also the servant of the sacred, Sacred Scripture and Sacred Tradition. The Pope is not free to reshuffle the 10 Commandments – to announce one day from now on we will keep the odds but drop the evens. That’s absurd, they are not HIS commandments, they are God’s commandments. And his first duty is to witness to the truth of God. By a happy coincidence of accidents and plain luck, I had the privilege of meeting Pope John Paul II personally three times: twice in Rome and once here at Dunwoodie. The first time was in Rome, April of 1986 at the Vatican. There was an International Conference on Moral Theology, and I was one of the 12 or 15 who gave formal papers at the Conference. The conference was at an institute by the Lateran but at the end there was a limited audience at the Vatican. Those of us who gave formal papers were seated in the front row and personally introduced to the Pope. Q: Is that O’Connor’s seminary? Yes. Q: Is that a good seminary? Yes. Then the Pope said: “You know, I used to teach moral theology.” To which I said: “Your Holiness: I think you still do.” At that he smiled and suggested that perhaps I might teach diplomacy because they all talked like that around me. But, after the kidding, he zeroed on a singular emphasis: the need to teach the truth about the good: to KNOW the truth; to LOVE the truth; to LIVE the truth. It was clear to me then and ever since, this man practiced what he preached; he lived what he taught. The surroundings in those audience halls are florid and museum like, but his eyes only sparkled and the gaze became fixed when he emphasized the truth. He was a humble man and a wise one – unshakably attached to the truth. This is why he could speak the truth to General Jaruzelski, President Marcos, the Sandanistas, Baby Doc Duvalier, George Bush or any priest – strong or weak. Scripture tells us: “the truth will set you free” (Jn. 8:32). That’s an important truth about the truth – the truth will set you free – free us from fibs, from pleasant myths, from trying to remember what tall tale I told you the last time so as not to contradict myself this time. Let me close speaking the truth in love: that God be merciful to John Paul II – the humble, wise and fearless priest who served God so faithfully and served us for so long – that where Jesus is now – he may also be. And like another pilgrim in another city, I come to this memorial to say goodbye and thank you to a really great man who was truly a good man. Goodbye for now, and, thank you, forever.